Many people love getting greenhouse kits for their backyard to help grow plants, flowers, and vegetables during the colder months of the year. 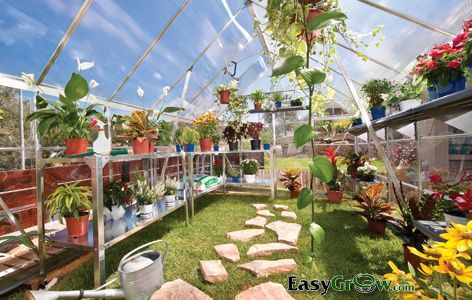 It’s to your advantage to get a kit for your greenhouse since you are able to easily put it together in your yard and don’t have to create the design and come up with all the materials on your own. Whenever you buy greenhouse kits, there are a few things that you should be looking for. Start off by finding a greenhouse that has insulation that is sufficient for your climate. Some areas are not that cold and only need mild help from the cool temperatures. Other areas need thicker plastics and glass to help keep out the cooler air. Make sure you understand what growing zone you are in and what type of insulation will work best for you. Be sure that the plastics will let in the type of light that your plants are going to need. Various types of plastic might block out or filter a certain spectrum of light that your plant might really need. Research this a bit before making your final decision so you can be sure your plants get the right type of lighting. The size of greenhouse kits will have to be accounted for whenever you get getting one for your yard. There might not be much space and your greenhouse will need to fit into the area that you have for it. Determine how much work you really want to put together into your kit. Some kits come with everything you need and are mostly put together while others require a bit more work. It’s important that you read reviews and notice what kind of time you might have to put into the project. Look into what materials are used to support the structure of the greenhouse. Many use wood since it’s a cheap material that will last for a number of years. The issue with wood is that it might rot in rainy climates and are prone to pest problems. Steel is a strong material that will stand up to most weather conditions although it will need to be treated for rusting problems. Aluminum is also a common structure that you can have in your kit. It’s very light and easy to work with. It will hold up pretty well although might not be suitable for very windy climates. Also take a look at the customer reviews for the greenhouse kits that you might want to get. This can help you get an idea if it’s a good product that you will be comfortable with using. All in all, keeping these points in mind should help you get the right kit for your yard so that you can grow your plants and flowers all through the year.